Obama, Like GOP, Wins, Loses In Tax-Cut Deal : It's All Politics In signing the tax-cut extension into law, Obama failed to keep a key campaign vow. So did the GOP. But both won important fiscal victories. Obama got an economic stimulus when it was said he couldn't. And Republicans forced Obama to break a key vow. 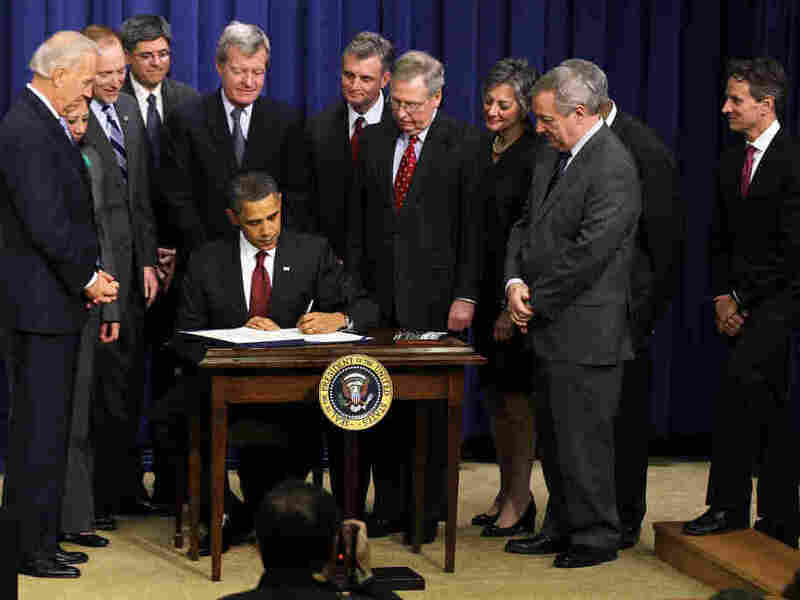 President Barack Obama signs the extension of the Bush-era tax cuts and jobless benefits. With his signing of the $859 billion package that extends the Bush-era tax cuts and jobless benefits, President Obama did something that seemed impossible only a few weeks ago. He got an economic stimulus bill through Congress when conventional wisdom said there would be no more such spending, especially not after the midterm elections which Republicans said was a repudiation of such fiscal policies. It's uncertain if the stimulus will be enough to nudge the economy to produce significantly more jobs than were created during Obama's first two years in office. Still, the spending is additional insurance against the economy stalling again. At least that's what Lawrence Summers, Obama's departing economic adviser, says. That kind of economic reversal would obviously complicate Obama's re-election hopes. For Obama, the choice came down to accepting a stimulus that broke his pledge to end the Bush tax cuts for the richest Americans or facing re-election without giving the economy its last best chance of getting a boost that might lower a nearly double-digit jobless rate. Not a hard choice, really. But while he won a stimulus, he also failed to keep a central campaign promise, which was to end the Bush tax cuts for income above the $250,000 level. So Republicans can justifiably claim to have handed the president a defeat since they forced him to sign legislation Friday that violated a key campaign pledge of his. Meanwhile, Republicans who ran during the midterms on reducing federal spending just voted to increase it, again by the better part of $1 trillion. The bill includes $485 billion for the tax cut extensions that apply to all taxpayers, $112 billion for a payroll deduction and $57 billion for unemployment insurance, according to a breakdown provided by the Center for Budget and Policy Priorities. House Republican leaders, like the next Speaker John Boehner, and the next majority leader Eric Cantor, weren't at the signing ceremony held at the Eisenhower Executive Office Building on the White House compound. And small wonder. The kind of spending contained in the bill has angered conservatives and Tea Party movement members. From Boehner and Cantor's persepective, it's probably better not to have visuals of them shaking the president's hands at the signing ceremony seeing as how that man hug between president and Gov. Charlie Crist backfired for the Florida politician. Unlike the Republican House leaders, Senate Minority Leader Mitch McConnell of Kentucky attended. But he inoculated himself right after Election Day from the Crist problem by saying his goal was to make Obama a one-term president. He had also just engineered the death of a $1.1 trillion federal spending bill the night before, giving him perhaps another bit of inoculation. And unlike the House members who are up for re-election in two years, McConnell doesn't have to run again until 2014.